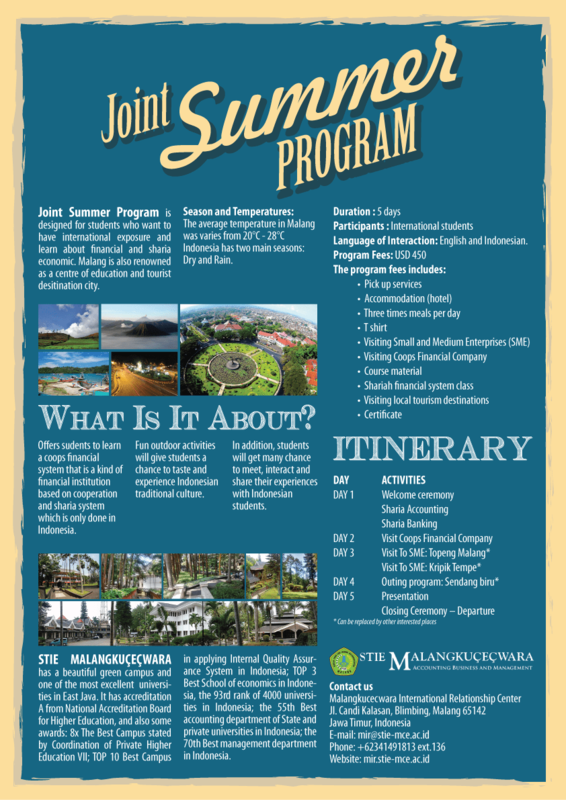 Joint Summer Program is designed for students who want to have international exposure and learn about financial and sharia economic. Malang is also renowned as a centre of education and tourist desitination city. Offers sudents to learn a coops financial system that is a kind of financial institution based on cooperation and sharia system which is only done in Indonesia. Fun outdoor activities will give students a chance to taste and experience Indonesian traditional culture. In addition, students will get many chance to meet, interact and share their experiences with Indonesian students. STIE MALANGKUÇEÇWARA has a beautiful green campus and one of the most excellent universities in East Java. It has accreditation A from National Accreditation Board for Higher Education, and also some awards: 8x The Best Campus stated by Coordination of Private Higher Education VII; TOP 10 Best Campus in applying Internal Quality Assurance System in Indonesia; TOP 3 Best School of economics in Indonesia, the 93rd rank of 4000 universities in Indonesia; the 55th Best accounting department of State and private universities in Indonesia; the 70th Best management department in Indonesia. Language of Interaction: English and Indonesian.